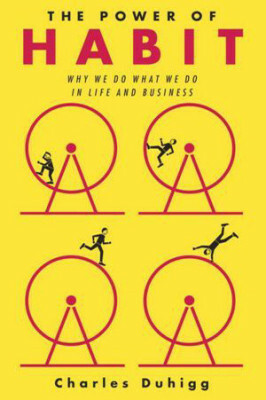 Today I finished reading The Power of Habit: Why We Do What We Do in Life and Business by Charles Duhigg. This book attempts to frame much of human behavior in instinctive habits that we repeat without thinking. Using real life examples and peer reviewed research, it describes how to create good habits and change bad habits at the personal, interpersonal, and organizational scales. I heard about the book after reading the excerpted version in The New York Times Magazine. The book opens with a detailed discussion illustrating the neuroscience that underlies habit formation. Duhigg explains that habits are driven by the basal ganglia, an evolutionary older section of the brain, versus other “higher” cognitive behaviors driven by the cortex, an evolutionary “younger” section. One of the most compelling examples of this distinction is the story of Eugene Pauly, a patient who lost significant cognitive function after a bout of encephalitis. Even though Pauly was unable to form new memories due to damage to the cortex, he is able to form new habits because the basal ganglia was unharmed. This explains why Pauly was able to instinctively take a walk around the block near his home with assistance, even though he could not map out the route if asked directly. The basic model, determined by neuropsychologists researching the basal ganglia in mice, is a three-step “habit loop.” In this loop, an external cue triggers a routine that leads to a reward. Duhigg adopts this habit loop as his framework for individuals seeking to create good habits and change bad habits. In order to create a new habit, it’s easier to create a cue and a reward around the routine we hope to retain (e.g exercising more) rather than trying to adopt the routine alone purely by force of will. In order to change a bad habit (e.g. overeating, drinking, nail biting, drugs, etc.) it’s easier need to leave the cue and reward in place and change the routine, rather than trying to ignore the cue and desire for a reward. But the habit loop is useful outside of the realm of self-help. Through a series of narratives and anecdotes, Duhigg scales up the discusses how the habit loop can be used by organizations. The analytics group at Target used customer shopping data for targeted (no pun intended) marketing of coupons and discounts, while casinos enticed a compulsive gambler to empty her savings at card tables. Leaders in organizations from Starbucks to Alcoa to Rhode Island Hospital to the Indianapolis Colts applied the habit loop—knowingly or unknowingly—in order to make meaningful changes in the behavior, performance, and satisfaction of their employees and players. The personal stories that Duhigg cites, where individuals enact meaningful change in their lives through modification of their habit loops, are the most believable. On the other hand, contorting success stories of organizations into the three-step habit loop framework can be a stretch. At times, some of the examples seem like pareidolia or apophenia: seeing patterns in fortuitous, cherry-picked data that is otherwise random or meaningless, like lucky streaks in gambling or animal shapes in clouds. Of course, habits are still useful at an organization scale, and good habits espoused by charismatic leaders can contribute to success. But the fates of organizations depends on a multitude of factors, only one of which is the application of cues, routines, and rewards in the habit loop. Although Duhigg pushes the envelope of credulity with some examples, The Power of Habit is an excellent book that reads like an extended New York Times Magazine or New Yorker article. It discusses strategies for self-help and personal improvement that are grounded in peer-reviewed neuropsychology, including an appendix with hundreds of citations. The injection of science into the realm of self-help—where discussions are normally filled with superficial slogans and cliché platitudes—is especially refreshing. I recommend The Power of Habit to anyone interested in neuroscience, psychology, addiction, interventions, or self-improvement.